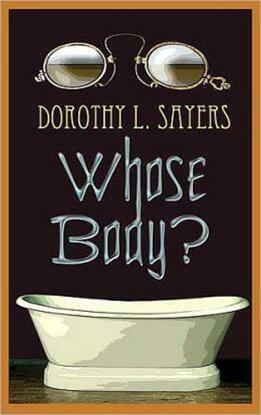 Home › Mystery › Dorothy L. Sayers’ Whose Body? Dorothy L. Sayers’ Whose Body? A scant two years before the introduction of that Belgian detective, Dorothy L. Sayers featured gentleman detective Lord Peter Wimsey in her 1923 novel, Whose Body? When we first meet him, Wimsey is in a taxi. He’s forgotten his catalogue for an auction and returns home to retrieve it. Just as he arrives his butler/valet Mr. Bunter informs him that his mother is on the line. “He sat down to the telephone with an air of leisurely courtesy, as though it were an acquaintance dropped in for a chat.” Wimsey learns from his mother, the Dowager Duchess, that “the little architect man who’s doing the church roof”, Mr. Thipps has just found a dead body in his bathtub. Promptly, Wimsey sends Bunter off to the auction while he changes into suitable clothes to go and view the body. “It’s wonderful, the ideas these rich men with nothing to do get into their heads,” states Mr. Bunter early on. At Mr. Thipps’ residence, Thipps informs Wimsey about the events that transpired that morning. How he discovered the body, and how the police arrived and inquired of the next-door hospital for any missing bodies. And then Thipps takes him to view the body. An unknown, middle-aged man wearing only a pair of pince-nez is lying in the bathtub. Wimsey also learns that Inspector Sugg has charge of the case. Prior to the events of the current story, Wimsey had been instrumental in recovering the lost Attenbury Emeralds. His interference in that case appears to have rankled Sugg but gained the friendship of another Scotland Yard man, Detective Inspector Charles Parker. “Sugg thought one of the young medical gentlemen at the hospital [next door] might have brought the corpse round for a joke.” Sir Julian Freke at said hospital, St. Luke’s, set aside his dissecting work, came round, and confirmed no body was missing from the hospital. Returning home, Wimsey receives a visit from Parker and is introduced to a second mystery. A financier Sir Reuben Levy has disappeared. He vanished the same night the corpse turned up in Mr. Thipps’ bath. However, the body in the bath is not that of the missing financier! But are the cases related? Wimsey, though initially more focused on the mystery of the body in the bath, involves himself in both cases, assisted by his man Bunter. The most vexing and intriguing clue is of course the pince-nez. As things come to a head, he suffers an episode, a nightmare of service during World War I, and is forced to holiday in the country to gather his wits. This psychological issue is handled with frank seriousness and is in odd contrast to Wimsey’s seeming flippancy through much of the early narrative. In fact, the tone of the second half of the novel turns more serious in nature as Wimsey—and others—realize just how dangerous the killer is. Lord Peter Wimsey may be an acquired taste. His affectations and speech are that of a gadabout or dandy and he takes childish delight in detecting crime. He serious side and determination are more apparent later in the story, but this makes for a less balanced narrative overall. Several online reviews suggest this isn’t the best introduction to Wimsey. However, it is the first book, and it’s often better to see a character (and novelist) grow into refinement and follow that progression. Whose Body? may not be the most challenging mystery—and the murderer seems to have gone to a lot of trouble to set the stage as it were—but many of the characters are a delight. I particularly liked how the Dowager Duchess deftly manages to navigate a conversation with an American businessman without knowing what her son promised him! Fans of period mysteries will enjoy this one. I entirely agree about the deft characterization here! Thanks for the review. Thanks for the comment, Beth! This review was a hard one to write without revealing spoilers. I so wanted to address the confrontation between Wimsey and the murderer in that scene toward the end, but thought that might be too revealing.